From James DeMonaco, the writer/director of The Purge film franchise, comes the provocative and terrifying last stand of a lone outpost of women in the wake of a deadly pandemic. Allie Hilts was still in high school when a fire at a top-secret research facility released an air-borne pathogen that quickly spread to every male on the planet, killing most. Allie witnessed every man she ever knew be consumed by fearsome symptoms: scorching fevers and internal bleeding, madness and uncontrollable violence. The world crumbled around her. No man was spared, and the few survivors were irrevocably changed. They became disturbingly strong, aggressive, and ferocious. 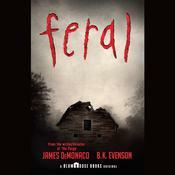 Feral. Three years later, Allie has joined a group of hardened survivors in an isolated, walled-in encampment. Outside the guarded walls the ferals roam free, and hunt. Allie has been noticing troubling patterns in the ferals' movements, and a disturbing number of new faces in the wild. Something catastrophic is brewing on the horizon, and time is running out. The ferals are coming, and there is no stopping them. 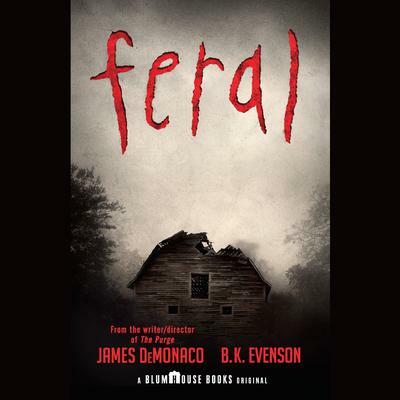 With Feral, writer/director James DeMonaco and acclaimed novelist Brian Evenson have created a challenging and entertaining novel of timely horror and exhilarating suspense. Read by Kirsten Potter, Brittany Pressley, Erin Spencer, Jorjeana Marie, and Hillary Huber. Three years later, Allie has joined a group of hardened survivors in an isolated, walled-in encampment. Outside the guarded walls the ferals roam free, and hunt. Allie has been noticing troubling patterns in the ferals' movements, and a disturbing number of new faces in the wild. Something catastrophic is brewing on the horizon, and time is running out. The ferals are coming, and there is no stopping them.